Putting your Mendel on a diet! Last spring, several of us had a RepRap breeding event where we basically put together three Classic RepRap Mendels by a team of 2.5 people over ten weeks. One of the three (called O’Blue) stayed in our lab. We’ve had quite a bit of fun and frustration experimenting with O’Blue. 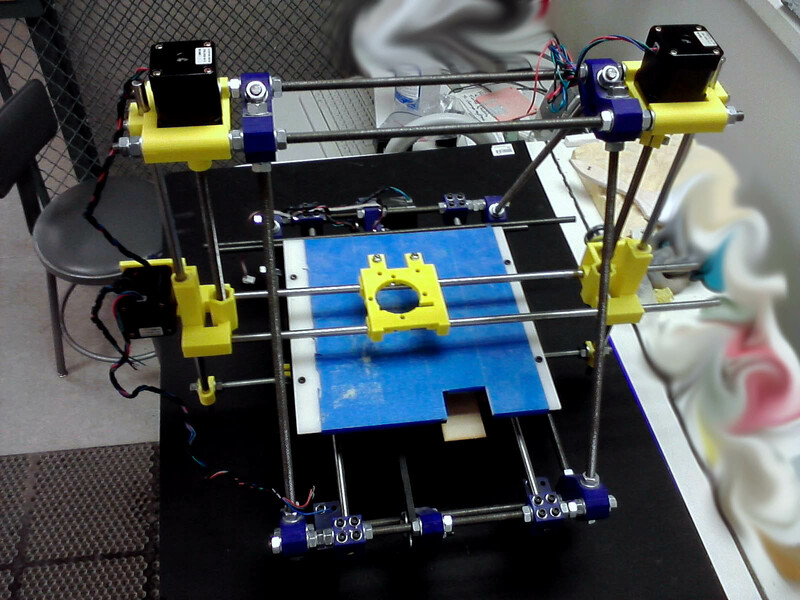 During the first week of January, I put together a new RepRap Prusa by myself (called Little Red). If I understand the numbers correctly, the Prusa Mendel has less parts total than just the X-carriage of the Classic Mendel. It is also substantially lighter in weight. After seeing Little Red in the lab, one discussion lead to another and another. “I know, let’s take a Sawzall to O’Blue and convert to a Prusa Mendel”. After more disussion, Nick (from RepRapBreeding) convinced me that the Sawzall was much too extreme. 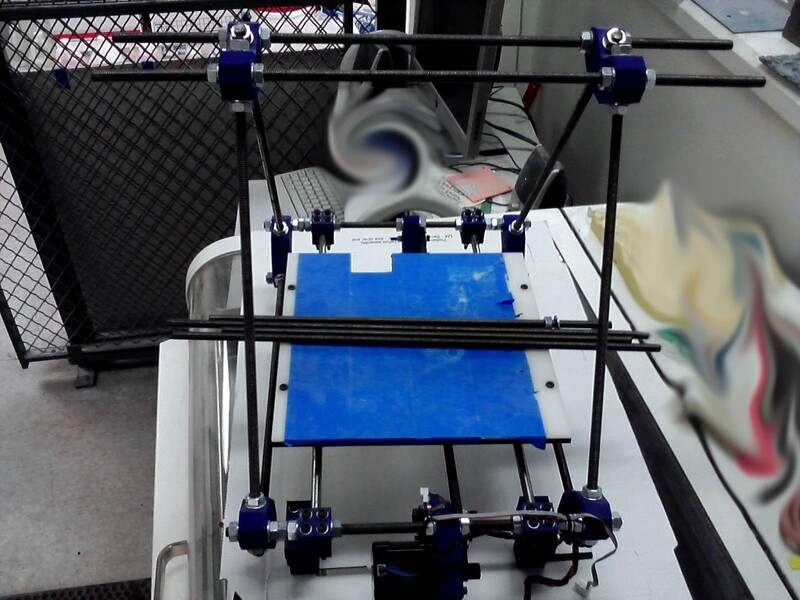 Thus, he offered to assist in removing all the Z-axis and X-carriage assemblies from O’Blue. With the assistance of an electric drill to spin the threaded rods, we removed all of the Z-axis and X-carriage assemblies in ten minutes (10 mins). Wow! Next, 3D print some replacement parts from the Prusa Mendel set (they are shown in yellow). Lastly, install, square and level. One of the things that I like about the Prusa Mendel is the ease of leveling/squaring-up of the Z-axis and X-carriage. I can do this in about 10-20 mins. Sorry about the picture quality (I only had my cell phone). The O’Blue is now sporting a fancy new light weight yellow Prusa carriage. I can’t wait to put the electronics back and get printing. 4 Comments on Putting your Mendel on a diet! Josef, glad you liked it. I spent over 8 hours on a classic mendel trying to get it squared and level and never got it right. I can square and level a Prusa mendel in 10-20 minutes. Cheers!